Have a child who is limited to gluten free meals or just need a better diet? 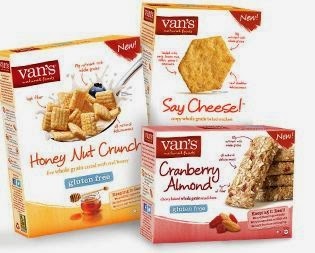 Check out Van's, Van's has a huge assortment of foods which are gluten free as well as being great for you. My son has a much better start to his day when I have him eat a gluten free breakfast. I have so many options to choose from for him with Van's. He can have pancakes, french toast, cereal, waffles and so much more. Michael loves the Van’s Gluten Free Cinnamon French Toast Sticks the most. He loves that they have the Cinnamon already baked in so yummy. For a snack I love to pack him some crackers, granola, or even snack bars which are again all gluten free. What also makes Van's crackers and other snacks so great is the school allows him to have them. Our schools here in Florida do not permit "unhealthy snacks" so its great to have more options with Van's as well. Michael loves all the snacks I don't think I have been able to find anything he really loves or hates when it comes to the selection of Van's Snacks. The Van's foods are not only great for my son but great for the whole family, when I am able I like to switch out the kids and husbands foods for a better option. For a little while because the family is not one for change I would purchase the crackers they liked once they finish I had kept the box and placed the Van's Say Cheese in and they never notice. Now its all I buy. You can find Van's foods in Whole Foods and even in your local grocery and retail store limited selection though if you look for it in a basic grocery or retail store. 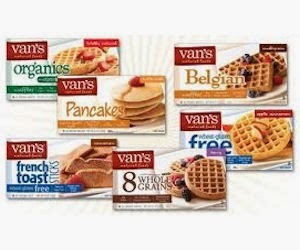 Whole Foods has a huge selection of Van's foods, I prefer to shop there when purchasing for my sons needs.